“They speak English, so they will be able to handle Australian market”. Nope. Modern SEO and especially international/multilingual SEO is not about in what language you write content, but also how you promote the content and how you approach users in the particular country. So, don’t ultimately expect that an Indian SEO company would be able to approach users in Barbados. TIP: Ask questions on the specifics of the market, or just let them talk about a project they’ve done there. Ask what the capital of the country is and what languages are spoken there. If they know the market well, they should know. Your International SEO Provider Should At Least Know Where the Country You Are Targeting, Is. “We’ll translate the content and be fine.” – Sorry, that’s not enough at all. Content should be carefully planned, divided into segments and localized accordingly. You treat blog articles differently, because you want them to remain easy-to-read and natural, compared to your website’s terms and conditions, which should be translated literally. TIP: Ask them about the actual workflow through which multilingual content is created. Native speakers are essential team members when it comes to content creation and SEO. Again, if you are targeting Canada, a Canadian native speaker would be preferred. Don’t accept the fact that your content would be roughly translated and then proofread by native speakers. Proofreading is focused utterly on grammar and style, but does not judge the content in terms of engagement. TIP: Ask which tasks within the multilingual content creation the native speaker handles. The more s/he is involved, the better for you. A bunch of happy clients versus no decent references whatsoever. Whom would you choose? Hard to say at this point. The former don’t tell much more than the latter. What you need to focus on are real measurable results. 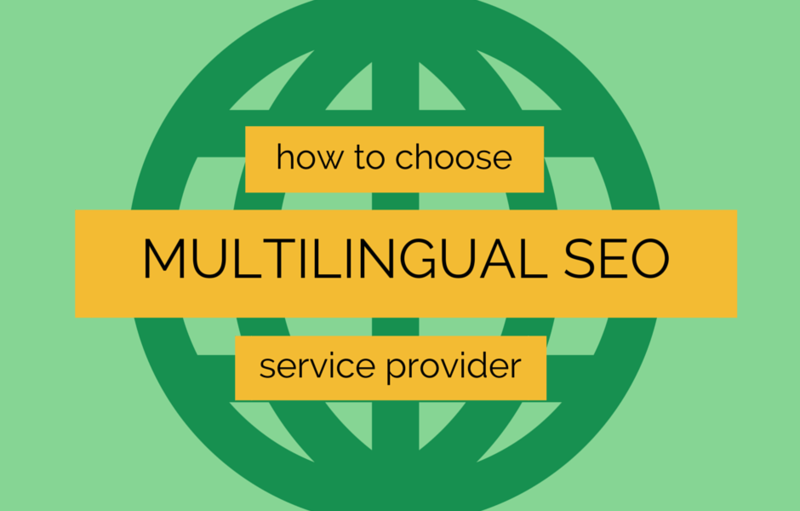 Results based on KPIs that your multilingual SEO provider had chosen at the beginning of a project. TIP: Ask about a reference project and the KPIs. Just be aware that website traffic increase or rankings aren’t that relevant for SEO today. What generally matters is conversions, bounce rate, referral traffic, organic traffic, traffic for long-tail keywords…Check this article on Econsultancy. Article directory submission, registration for PR websites, link submission into Delicious – tactics that are 5 years old, not working anymore. Spinning content across noname social media profiles – can bring irrelevant traffic. Buying links and advertorials, manipulating rankings (“we’ll get you to the 1st page”) – dangerous tactics, risk of penalization. TIP: A good sign is if the provider is asking about your audience, customers, users. They should come up with a tailored strategy based on the channels your audience is using. Not necessarily for free, however. TIP 2: Check link profiles of the websites they’ve done SEO for. Use MajesticSEO or OpenSiteExplorer. If you find low quality, irrelevant links, or a lot of links coming from a few domains, that’s definitely a warning sign. When Choosing a New SEO Provider, Check Link Profiles of Their Past Projects Using @MajesticSEO. Do they do some form of research? Do they consult their strategy with in-market experts? Or do they just duplicate “what’s already working elsewhere” and trying to teach a French guy love fish and chips? TIP: A strategy that have worked on one market rarely does on another. Oh yes, sometimes it did in Norway and Sweden. But at least doing research and find out would be a basic thing to do. Have you found my article helpful? Share the knowledge with your colleagues and friends!